#Writers Note# This article will be added to as additional winery profiles are written. Stay tuned! We all know MissWineOH is all about the beauty, increasing quality, and friendliness of Virginia Wine. But lets talk about one of the most stunning grape growing areas I’ve had the privilege to visit. Niagara on the Lake, Ontario. Just a 3.5 hour drive from Cleveland, for the wine lover, this is a must do vacation on the east coast. A brief stop on either end at beautiful Niagara Falls is a nice break from the wine. Though, if you haven’t had enough, or want to get started, all of the restaurants we went into only served Ontario wine, something you definitely don’t see in the US. The Canadian Falls area is much more touristy and great for families in need of entertaining their kids. If you want a more relaxed visit, take in the American side, which is a park preserve, and you can go down near the falls on that side. That’s a LOT of grapes. And then just 10km north, you start seeing this. Our visits took us to 12 wineries, several restaurants, and into a wine community that we fully intend to explore again. Our two day trip marked off less than 1/2 of the wineries in Niagara on the Lake alone. For a great wine trip planner visit Wine Country Ontario. 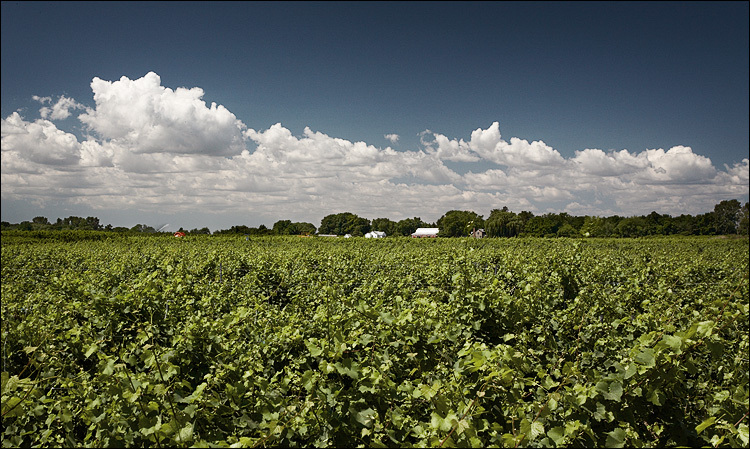 The Niagara Peninsula appellation is the designation for this area, and there are 32 varietals being grown on 13,600 acres. Within the Peninsula, Niagara on the Lake is a regional designation, encompassing four sub-appellations: Niagara River, Niagara Lakeshore, Four Mile Creek and St. David’s Bench. While this may seem like a deep dive into naming conventions, it helps to understand this as you visit the wineries throughout Niagara on the Lake, because these designations become apparent in the wine, even in such a small geographic area. I was in wine geek heaven. For more information on soils, climate and other geeky information, visit the VQA Ontario. And speaking of VQA. When you put your hands on a bottle of Ontario wine, you will find the VQA label on most of them. VQA Ontario is a provincial regulatory authority that administers Ontario’s wine appellation system. It’s primary functions are wine testing, audits, inspections, and compliance. This indicates a standard of quality the wine is upholding (via testing and approval) when it bears that label. Click on a name below to see our adventures! After reading my notes from the wineries, you may think that I loved everything in Niagara. I can tell you that there’s only one winery I encountered where I didn’t care for any of the wines I tasted, but that doesn’t mean they were bad. Just not what we were after. If you’ve visited these wineries, please add your thoughts – and if I missed one you think I should add to the next trip, I’ve started a list, so please add those in the comments as well! Posted in Ontario, reviews, travel, wineries. Bookmark the permalink. Not much I can off if you are talking with Fred above. Hi Fred if you read this :). Anyway, it looks like you were busy, but absolutely, Fred is correct. You have to hit up the bench. Being at Thirty Bench there are several I would recommend that are within about a mile (Hidden Bench, Fielding, Organized Crime and I don’t know the wines well enough but there is also Angel’s Gate, Rosewood and East Dell right there as well). I am curious as to the “not-so-good” winery but no need to slam anyone. Given where you were I have a fairly good idea who it might be. I know who I would put in that catagory anyway. Another place I think you should definitely check out next time is Niagara College. I know I have a wicked bias, but the wine, beer and food is awesome. The wines are made by Terrence Van Royen who has been around for quite some time and is an awesome winemaker. I have no clue of the name of the person that makes the beer, but I have had some and it is great. The Culinary institute has a lot of the top names from around the area and it shows in the restaurant. Let me know if you are going there and i can give you the name of someone to ask for that will help you out. Yes, I agree with all your recommendations except that EastDell is no longer a separate winery but part of Diamond Estates Winery (formerly 20 Bees). The plan is for Mike Weir to open up his winery on the site of the now closed EastDell. I would also recommend a visit to Malivoire Winery, Tawse, the Good Earth Winery and Cooking School, Creekside, Featherstone, Ridgepoint, Di Profio, Cave Spring and Vineland, all in West Niagara. There are many others! Thanks for stopping by Jordan. I had to laugh when the conversation got started about me spending 10 years in VA (because I seem to use VA as a benchmark) and then was asked “do you know Tarara?” I really appreciate the recommendations for our next trip and the trip after that, and after that… – and biases are ok. We all have them! I’ll certainly let you know when we prepare to head up again. Love that its only a few hours from Cleveland! It is a shame I only got to one in Beamsville – but there was only so much time, and I was totally shooting in the dark at a wine map when I picked what I picked. The one I didn’t care for isn’t mentioned by name…. been debating on whether to write about it. Please email me if you’d like my thoughts on that one. misswineoh at gmail. Thanks for stopping in to read, I really appreciate your comments.